Try a unique alternative to a typical night out in downtown Boston with an exciting dinner cruise along the city’s waterfront. This 4-hour expedition on Boston Harbor features an all-you-can-eat buffet meal with live entertainment and dancing. Take a stroll under the stars and enjoy the view of the illuminated Boston skyline at night or head to the dance floor for music and fun inside the ship’s nightclub. Bring that special someone or a whole group of friends for a night to remember. 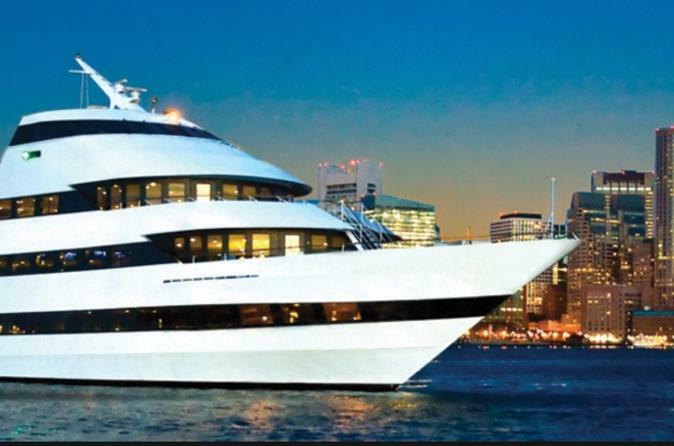 Boarding for this 4-hour cruise on New Year’s Eve starts boarding at 8pm from the Seaport World Trade Center at Commonwealth Pier. Your cruise departs on the water at 9pm sharp. This dinner cruise is one of the best ways in Boston to see the city from the historic waterfront. Three climate-controlled interior decks with panoramic windows allow for a perfect view of the Boston skyline. As your ship takes off from the pier, head to the elegant dinner buffet, complete with salads, entrees, and desserts. During dinnertime, be entertained by live performances, and after eating, hit the dance floor and boogie to songs spun by a live DJ. Grab a refreshing cocktail at the floating rooftop lounge (own expense), and then make your way to the spacious observation deck for a moonlit stroll under the stars. Notable attractions to see along the route include Zakim Bunker Hill Memorial Bridge, the historic USS Constitution, and Boston’s thriving Seaport District. Your cruise ends at 1am when your boat docks back at the pier.